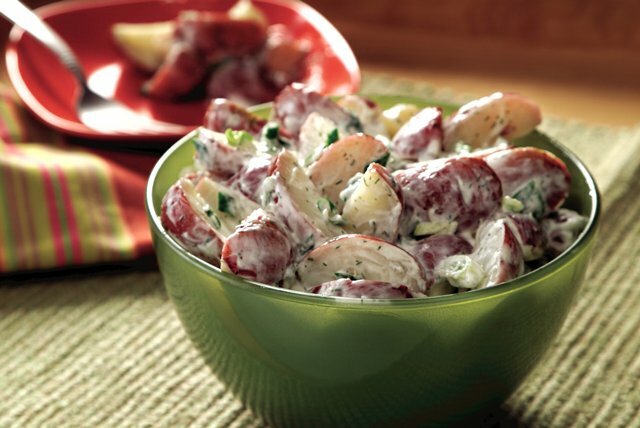 Try our delightful Dill Potato Salad today. Mayonnaise, seasoned with pepper and dill weed, lightly coats potatoes and green onions for a summery salad. Mix mayo and seasonings until blended. Combine potatoes and onions in large bowl. Add mayo mixture; mix lightly. To cook the potatoes in the microwave, place quartered potatoes in 3-qt. microwaveable casserole. Add 1/3 cup water; cover. Microwave on HIGH 14 to 16 min. or just until potatoes are tender, stirring after 8 min. Drain.